This year, the 21st annual Vilnius International Film Festival (Vilnius IFF) took place from March 31 to April 14; also called “Kino Pavasaris / Cinema Spring”, it is one of the most eagerly-awaited cultural events in Lithuania. The Festival has become noted for its high-quality film program and satellite events such as master classes and guest lectures given by internationally renown professionals. Over the years, the Festival has also established working relationships with other international film festivals, various companies, distributors, and independent producers. More than 100 000 people attended the festival – an impressive number considering that the country has a population of less than three million. Every year the Vilnius IFF screens more than 200 films spanning several categories. Each category is evaluated by a group of professionals and film critics gathered from around the globe. This year's official categories were the following: “New Europe – New Names”; “Baltic Gaze”; “Short Film Competition”; “Student Film Competition”; “Masters”; “Critics' Choice”; “Discoveries”; “Festival Favorites”; “Documentary Film”; “Comedies”; and “I am Hybrid”. Separate parts of the program were devoted to such themes as: the culinary arts; family films; Shakespeare; the works of Lithuanian director Raimondas Vabalas; this year's short and feature films from Lithuania; and films by Lithuanian directors living and working outside of Lithuania. Arterritory.com visited the closing days of the Vilnius IFF in order to get a feel for the Festival's atmosphere, catch at least a handful of screenings, hear the opinions of professionals in the field, and, of course, find out who won in each of this year's categories. This was my first visit to the Vilnius IFF (and I am now absolutely certain it won't be the last), and I was pleasantly surprised – even to the point of experiencing a bit of a culture shock. I have never been to such a well-organized event, one in which every detail has been thoroughly thought through from A to Z; this fact was again highlighted when, at the closing award ceremonies, every single winner praised the Festival's excellence in organization. Taking into account the large number of events scheduled during the last few days of the Festival – including several press conferences, afterparties, and lectures and inspiring speeches given by eminent people in the film industry – I was only able to catch a few of the featured films. The first event I went to upon my arrival in Vilnius was the annual afterparty hosted by the renown Lithuanian film director Šarūnas Bartas. Immediately to my liking was the fact that the moment I entered the reception and flashed my press card, I was informed that smoking was allowed throughout the premises. This is worth mentioning not only because I love to smoke, but also how this one factor helped create an illusory atmosphere of times past. During the event an orchestra played in the background for two hours, with one of the violinists being none other than the actress Lora Kmieliauskaite, who played the lead role in Bartas' 2015 film “Peace to Us in Our Dreams”. 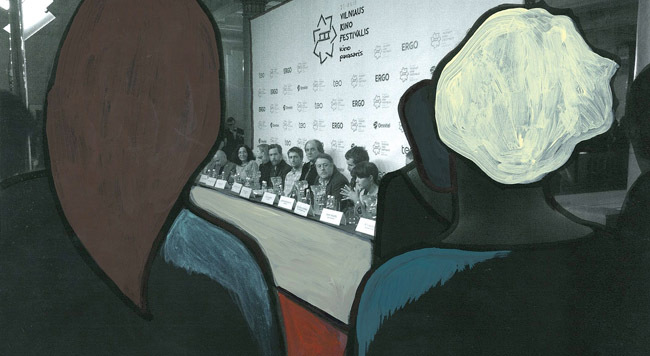 While enveloped in expressive music, clouds of cigarette smoke and the buzz of people chatting, I had the chance to talk to Ariel Schweitzer – film historian, critic and editor-in-chief of the French cinema magazine Cahiers du Cinéma; Schweitzer was invited to sit on the Festival's judging panel for the category “Baltic Gaze”. Although at that time he hadn't yet seen all of the nominated films, when asked which film had stood out the most for him so far, he named Vitaly Mansky's already multiple-award-winning film “Under the Sun”, giving me a short summary of it along with some behind-the-scenes details. It turns out that Mansky was invited by the government of North Korea to make a film showing the regime's “good side”, but he secretly filmed things that weren't written into the officially accepted script. At one point he stopped filming and returned to Russia because the Ebola virus was quickly spreading in North Korea. After that, Mansky was prohibited from entering North Korea again. Luckily, he had enough filmed material with which to put together a completely different film, one which showed how the North Korean propaganda machine works. Schweitzer adds that it is not just a film about propaganda, but also a film about losing one's innocent naivety, for the film's main character is an eight-year-old girl who loses her naïve outlook on life, her spontaneity and fragility, and slowly becomes a product of the authoritative regime. Schweitzer believes that it is a great film on the propaganda regime, the mechanisms through which it works, and how it influences a child's view and her ultimate surrender to the inevitable as she comes to understand how she will have to live the rest of her life. Schweitzer also mentioned Laila Pakalniņa's film “Ausma”, about the soviet Pioneers youth group, saying that it was a very interesting film with a good choice of subject matter and with potential, but in his opinion, the film's try-hard aesthetics and style were too overpowering, thereby drowning out the film's main theme. Schweitzer said he could see influences from Hungarian director Miklós Jancsó and Russian director Elem Klimov in Pakalniņa's film, emphasizing that he has absolutely nothing against aesthetics in film, but only if they enhance the film, not take attention away from the film's subject matter. During my days in Vilnius, I attended various official and unofficial events. One of the most illustrious, of course, was the Vilnius IFF closing awards ceremony. 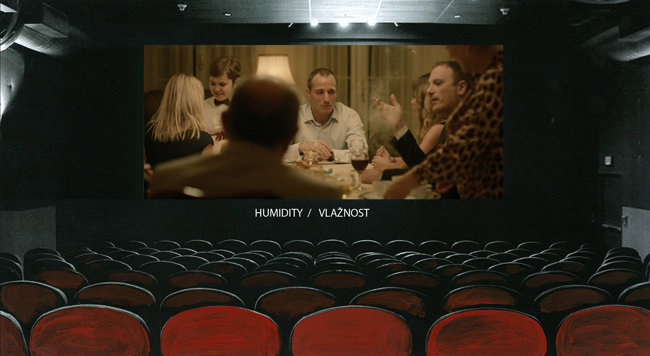 Two top awards were given in the category “New Europe – New Names”: the Czech film “I, Olga Hepnarova”, directed by Petr Kazda and Tomáš Weinreb; and the Bulgarian film “Thirst”, directed by Svetla Tsotsorkova. The Best Director award went to Agnieszka Smoczyńska from Poland, for the film “The Lure”. The award for Best Actress was given to Monika Naydenova from Bulgaria, for her work in the film “Thirst”, while the Best Actor award went to Uliks Fehmiu from Serbia, who starred in the film “Our Everyday Life”. 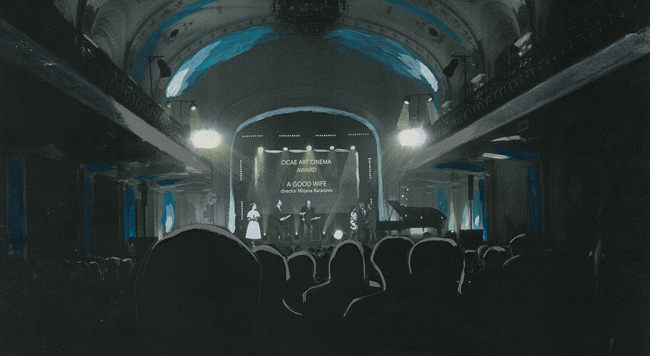 Films in the “New Europe – New Names” category were also judged by the International Confederation of Art Cinemas, who chose to honor the film “A Good Wife”, by Serbian director Mirjana Karanović. In the category “Baltic Gaze”, Vitaly Mansky took top honors with his film “Under the Sun”. Best Director went to Mantas Kvedaravičius for his film “Mariupolis”. Trine Dyrholm was named Best Actress for her role in the Danish film “The Commune”, and Oleg Maksimov took home the Best Actor award for playing himself in Jerzy Śladkowski's documentary “Don Juan”. The jury also decided to give out a Special Mention award to the film “Granny's Dancing on the Table”, by Swedish director Hanna Sköld. In the Short Film category, the main prize went to “Fear”, by Slovak director Michal Blaško. A Special Mention award was given to Fanni Szilágyi's (Hungary) film “End of Puberty”. Audience Choice awards were given to the feature film “Truman”, by Spanish director Cesc Gay, and the short film “Otto”, by a group of Flemish directors – Marieke Blaauw, Joris Oprins and Job Roggeveen. 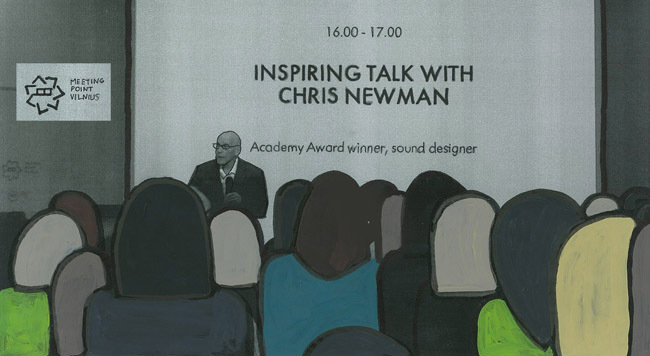 In looking back at my time spent at the Festival, I can safely say that one of the most valuable experiences (and greatest moments of joy) was listening to Chris Newman's “Inspiring Talk”, as it was labeled. Chris Newman is a sound editor for films, with some of his best-known being “The Godfather”, “Amadeus”, “The Exorcist”, “The Silence of the Lambs”, and “The English Patient”. Newman has been nominated for an Oscar (the award given out by the American Academy of Motion Picture Arts and Sciences), for sound, eight times – and has won three times. He himself said that one shouldn't put too much weight on the Oscars: “About six to seven thousand people work in the industry; the sound is judged by people who don't understand anything about sound, who only think the louder and the more of it, the better! I, for instance, very much liked the sound for “The Godfather”, but “Cabaret” won that year. You know why? Because “The Godfather” wasn't a musical [laughs]”. Newman has been retired from sound editing for seven years now, but still works as a professor in New York, thereby handing down his knowledge to the younger generation. Newman showed some clips of films for which he did the sound. When he puts on a scene from “Amadeus”, the one in which Mozart perfectly plays a piece that he has just heard for the first time, Newman laughs. He laughs every time he watches this scene. After the clip is done, he says: “And what do you think? I think the sound was pretty good, right?” and laughs along with the public. When asked if he can watch a film without giving all of his attention to the sound, he answers that he likes to enjoy the watching of a film. If the film is a piece of crap, then, of course, he'll take it apart, but otherwise, he simply enjoys watching films. During his talk, Newman was in constant contact with the audience – asking them what they think, throwing out questions, recounting various episodes from his life, and making clever asides that elicited waves of laughter. When asked if he's been mostly satisfied with his work, he responds: “Usually there are parts of a film that I'm working on that I don't like. However, there have been exceptions – for instance, “The Godfather” is one of the best films I've worked on; also, “Silence of the Lambs” and “Amadeus”.